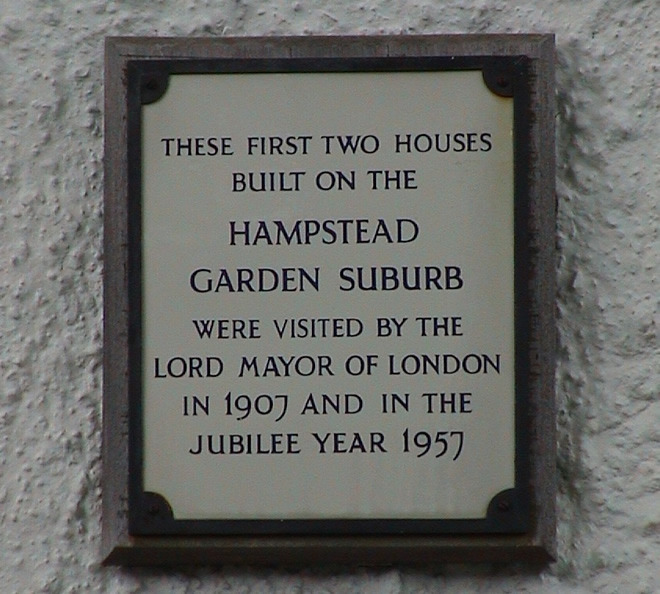 These first two houses built on the Hampstead Garden Suburb were visited by the Lord Mayor of London in 1907 and in the Jubilee year, 1957. On 2 May 1907 Henrietta Barnett cut the first sod here. The ceremony involved children dancing around maypoles, the presentation of flowers, the reading of not very good poetry, and adjournment to a marquee at the Royal Oak Hotel for lunch. The Hampstead Garden Suburb website says "The pair of cottages on the corner, numbers 140-142, were the first to be built in the Suburb in 1907."